Remember how we’ve talked about both Cynthia and Garchomp? And how they formed a particular archetype of sorts? Well Lucario fills in that missing link that makes Cynthia-Garchomp feasible. Lucario is a Stage 1 Fighting Pokemon, 110 HP, with a Psychic Weakness, no Resistance, and a Retreat Cost of 1. His Ability, Precognitive Aura, lets you put any card you want from your deck to your hand…so long as you have a Garchomp in play. Missile Jab is then a 2-for-70 attack that is unaffected by Resistance. The combination in mind is pretty simple after that, as I’ve mentioned before – Lucario uses Precognitive Aura to add Cynthia to your hand. You activate Cynthia, as you normally would, shuffling back your hand and drawing 6 cards. And then, since you’ve played Cynthia this turn, Garchomp’s Royal Blades attack does 100 more damage, totaling at 200 damage total prior to any other boosts. Combined with an assortment of recycling carsd to put Cynthia back in the deck to repeat the process, and you can see that the archetype can very consistently get out 200 damage each turn. The thing about Lucario is that he’s not bad…per se, but he’s a bit reliant on Garchomp being in play to be amazing. On his own, he’s just got Missile Jab, which while it’s not a bad attack, it’s not the ideal attack you want to end up on. Not to mention you’re dealing with the inconsistency of bringing out both a Stage 1 AND a Stage 2 Pokemon. Cynthia’s the easy part, you play 4 of her, and you play cards to get her back into the deck – but you also need to run cards that can efficiently get both Lucario and Garchomp out and into play ASAP, and that’s the part that’ll need some work. I don’t think the consistency of the deck will be good enough that you can get them both into play often enough to win a major tournament, but at the same time, I’m not going to throw out the possibility either. Rare Candy can make up for Garchomp, whose Evolution line does have Ascension to really boost the consistency, but as far as Lucario goes, he’s sort of the weak link in the chain. Riolu was not as blessed to get a quick means of evolution like Gible was. And that might be what ultimately impacts the deck. Arora Notealus: Lucario does a lot of good things under specific conditions, and he can really make the deck run fluidly once he’s in play. The main problem is establishing that setup, and that’s not easy when you can’t get him out instantly. Wally would help with this…but then you’re running Wally, which means you’re in Expanded, which means you could probably run a better deck that’s more consistent. Side Review: Garchomp – how appropriate that I get to revisit Garchomp on the day I review Lucario! I don’t want to say that I’ve proven my point by talking about Lucario here and then having the Garchomp deck not topping any regionals might be a dead giveaway that I’m right, but like I said, the biggest problem the deck has is getting both Lucario and Garchomp out into play. Ascension is itself too slow, though it is a nice effect to use, and getting Lucario out isn’t easy if you don’t start with him. As a result, the deck falls a bit flat, and that’s likely where it’ll remain competitively. Casually though, I’d give this a whirl! Next Time: A throw back to the friendly belt of a highly-skilled master. Lucario (SM Ultra Prism 67/156) makes its way in the TCG as a regular Fighting Type with 110 HP, weak to Psychic, and a retreat cost of one. It’s ability, Precognitive Aura, lets you search your deck for a card and put it into your hand IF you have a Garchomp in play. This ability stacks; if you have four Lucario and at least one Garchomp, you can search your deck for FOUR cards! This refers to Stage 2 Garchomp cards, not Garchomp EX or M Garchomp EX, or even old cards like Garchomp Lv.X or Garchomp SP just to be clear. Missile Jab does 70 for FC while ignoring resistance. The DRX 91/124 version is a Dragon type with 140 HP, weak to Dragon, and free retreat. Jet Headbutt does 40 for C. Sand Tomb does 80 for WFC and prevents the Defending Pokemon from retreating. As this is coming from a Theme Deck, I don’t expect this card to accomplish anything except enticing newer players to have this particular Pokémon the first time. The DRX 90/124 version is a dragon type with 140 HP, weak to Dragon, and a retreat cost of one. Mach Cut costs F for 60, and discards a Special Energy from your opponent’s Active Pokemon. Dragon Blade does 100 for WF and discards the top two cards from your deck. This was once the headliner of a deck back in 2012 that players were excited about: a semi-competitive deck without EX Pokémon. That deck was called Garchomp/Altaria, and with Altaria’s Fight Song ability, it lets Dragon Pokémon do even 20 more damage. Unfortunately, this deck was considered too linear, with little room for other tricks. This was the fifth best card of BW Dragons Exalted. The BPT 70/122 is a Fighting Type with 130 HP, weak to grass, and free retreat. Turbo Assault does 60 for F and also attaches an Energy card from the discard to one of your Pokemon. Bite Off costs FF for 80 damage, plus 80 more if the Defending Pokemon is an EX Pokémon. This was the fourth best card of XY BreakPoint due to Maxie’s Hidden Ball Trick giving this Garchomp easier access while skipping it other stages below it. Nowadays, EX Pokémon has been retired in Sun & Moon onwards, so Bite Off will be less effective. You can still count on chiefly OHKOing most Basic EX Pokémon with Muscle Band boosted Bite Off. And the ULP 99/156 version is a Dragon type with 150 HP, weak to Fairy, and free retreat. Quick Dive costs CC and can do 50 damage to one of your opponent’s Pokemon. Royal Blades costs FCC for 100 damage, plus 100 more if you played Cynthia during your turn. Regardless, I would prefer using the ULP version than any of the other Garchomp cards mentioned. It hits harder than other cards as well as higher HP. Since there are at least one playable Garchomp card, it gives Lucario a reason to be used due to it’s ability. And that single retreat cost from Lucario can be handled with an Escape Board. In Limited, one of the evolution packs contained a 3-2-2 Garchomp line, one Riolu, and one Cynthia, so if you happen to pull Lucario from one of your four booster packs, then temporary consider yourself a mini-deck of the real thing! 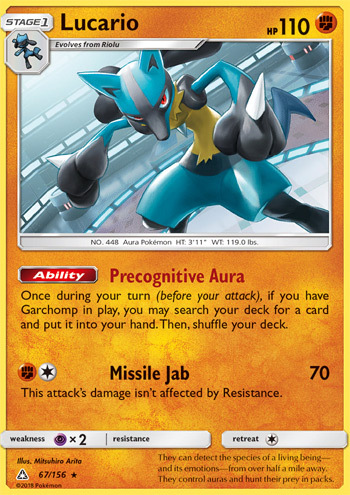 Lucario (UP 67) busts his way back into the meta in the Ultra Prism expansion set. The designers clearly built this card to complement Garchomp (UP 99). Getting two Lucarios out really makes that Garcario deck hum. I’ve written a few times about how I’m just not a big fan of the archetype. I haven’t had much success with it myself, and I dominate it when I play my best decks (I’m actually 11 W 3 L against it with ability denial decks). Please correct me if I’m wrong, but I don’t think it’s had even the tiniest inkling of success at any tournament, but part of that might be because I don’t think it sees much play IRL. I see a ton of it on PTCGO though – it’s the second most common archetype I’ve faced since UP’s release. I played against 55 Garchomp decks in February and March. I actually only saw Buzzwole 53 times in the same time frame. Fortunately, I think the PTCGO lovefest for Garchomp is dwindling as I’ve only come across it three times this month (I’ve beaten it all three times). I will probably try it again at some point, and I’ll probably tech in a couple of Buzzwoles. I haven’t actually tried it myself, and I haven’t seen anyone else try it either, but it just seems to me that if you can get Buzzwole going early, that might give you time to get a couple Garchomps built up. I’m not 100% sold on the idea, though, so I’m not rushing straight away to try it out (I’m still on my twelve step program with Sylveon anyway). But the ability to go choose even just a single card out of your deck each turn is pretty powerful, and I feel that that would make Buzzwole decks even better than they already are. And Buzzwole’s going to need something to help it out considering all of the Psychic decks that will be coming out of Forbidden Light. Maybe a Garchomp / Buzzwole combo might be the way to go in a Psychic heavy meta. Plus, the Fighting type Garchomp will be coming out in Forbidden Light as well, and maybe that will fare better than the Dragon type.